Source: Mid-West Automation Systems, Inc.
Cams are a major strength and primary feature in all our machines. They are designed and then produced efficiently on our multi-axis, CNC equipment. Barrel cams, cams and lineal translating cams are programmed on sophisticated software. A series of CNC and multi-pallet machining centers allow for multiple tooling of low and high volume parts. Additional precision part work is done on our wire EDM machines allowing us to produce intricate tooling. Work centers can run twenty-four hours a day with significant unattended operations contributing to maximum utilization and cost savings. Complete in-house machining of piece parts is accomplished over multiple shifts by our skilled toolmakers. Presently, we have over 180,000 hours/year/shift pf part making capacity. Machine bases, sounds enclosures, weldments and guarding are all fabrictes and painted in-house. Skilled machinists and tool makers with many years of experience in tool and form grinding produce high-speed dies which are incorporated into our assembly machines. Our fully staffed and equipped inspection department inpects all manufactured and incoming components for assembly proior to release. 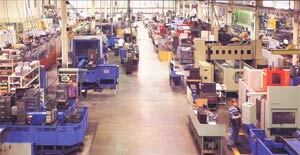 Mid-West Automation Systems, Inc., 1400 Busch Parkway, Buffalo Grove, IL 60089-4505. Tel: 847-541-3570; Fax: 847-541-8562.